In order to lead a life that is full of energy one needs to have an optimal weight. Quite often it so happens that you are unable to gain weight, despite numerous efforts. Not only can this lead to a low self-esteem, but may also compromise your immune system and even fertility. Thankfully, you won't have to worry about reaching that appropriate level of BMI anymore. 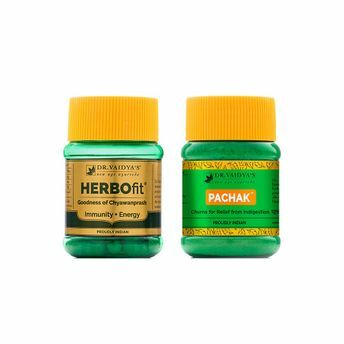 Dr. Vaidya's Weight Gain Pack comprises of two highly trusted weight gain medicines - Herbofit and Pachak Churna, which will help you achieve your health goals seamlessly. Herbofit is a concentrated extract of 21 active ingredients, used in conventional Chyawanprash, availed in the form of a capsule. Specially designed for the modern consumer, Herbofit is both convenient and easily consumable. With all the benefits of the best chyawanprash for immunity, the herbs in this capsule help prevent illnesses and ailments by building up the body's resistance. This immunity booster medicine aids all three doshas - Vata, Pita, and Kapha by improving one's immunity system. Dr. Vaidya's Pachak Churna is a specially formulated weight gain medicine which stimulates the 'digestive fire' thereby allowing better absorption of nutrients leading to natural weight gain. Ideal for those dealing with indigestion, loss of appetite, bloating, acidity or other digestive disorders, Pachak offers quick relief.